A beautiful book of pictures and stories about everything related to the fine art of Italian race bikes. Passionate fans of Italian bicycles, professional bicycle racing, the history of the sport and/or fine craftsmanship must add Italian Racing Bicycles to their collections. 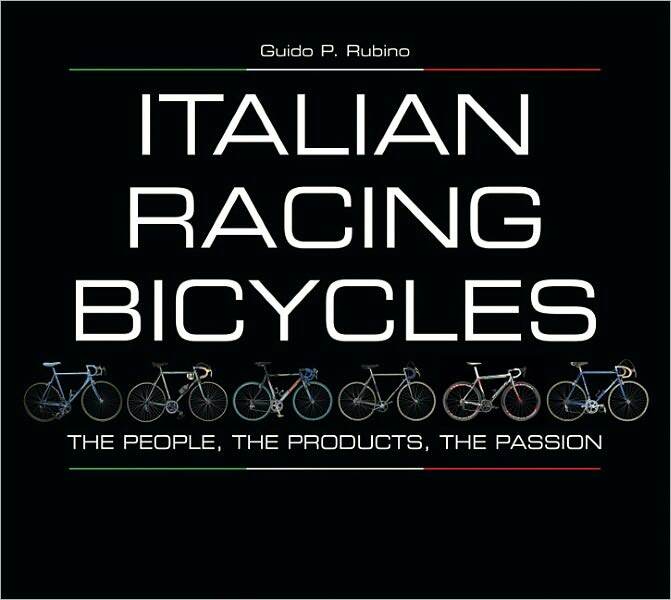 It’s not just about bicycles, as the title suggests, but about the companies that made (and still make) them and about the Italian cyclists who ride competitively. Top-of-the-line Italian bikes are works of art as well as masterpieces of function, and Guido Rubino considers 40 of the finest manufacturers: their histories, likely futures, personalities and history-making products. The indispensable Colnago, Campagnolo and Bianchi brands are covered, as are the men who originally bore those names. Racing greats such as Coppi, Pantani, Sarroni and Bartali, whose performances helped establish the legacies of these companies, receive well-deserved attention here as well (along with select non-Italians like Eddy Merckx). Plenty of beautiful pictures complete this lovely coffee-table book. This review originally ran in the December 6, 2011 issue of Shelf Awareness for Readers. To subscribe, click here, and you’ll receive two issues per week of book reviews and other bookish fun!